These Monster Peanut Butter Oatmeal Cookies have it ALL! 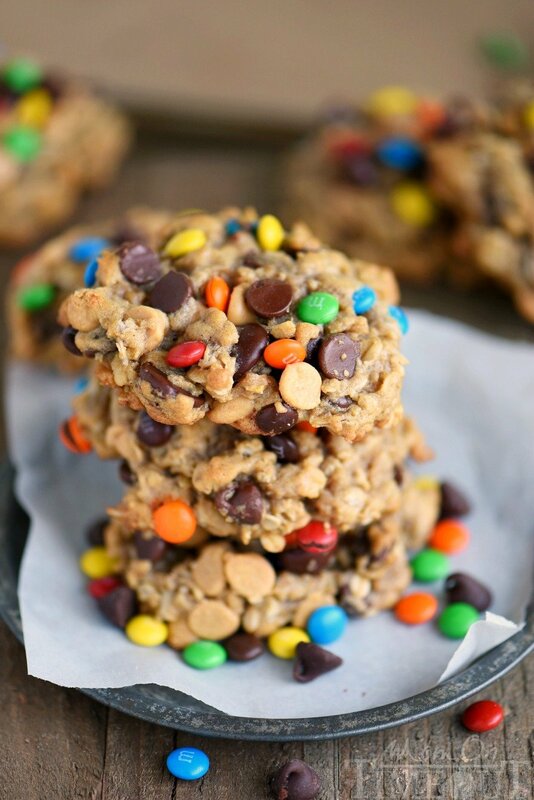 Each bite is filled with chewy oats, peanut butter, chocolate chips and M&M’s! Truly the perfect cookie! Don’t miss any of my recipes! Sign up to get my new recipes in your inbox! Follow me on Facebook and Instagram too! Finally got around to tackling the backyard this past weekend. We had this crazy infestation of midges for the last few weeks and they are seriously the most annoying insects ever. They’re like tiny mosquitoes but they don’t actually bite? But they are swarmers in the worst way. Anyways, those days are behind us and I finally was able to get plants planted, weeds pulled, and clean out all the old stuff from last year. I’m excited. I’ve been picking strawberries for days now and I just can’t wait for our cherries, and plums, and peaches, and apples to ripen. Oh, yes, almost forgot – my grape vine went CRAZY! I have like 30 bunches of grapes growing and I am literally giddy with excitement every time I look at them. I need to make sure to feed the vine because I want those grapes – bad. We had two very small bunches last year and they were the highlight of the whole summer. Anyways, to make up for all that fruit we’re going to be eating in the near future, I wanted to make sure to load up on cookies now…. So let’s talk cookies. 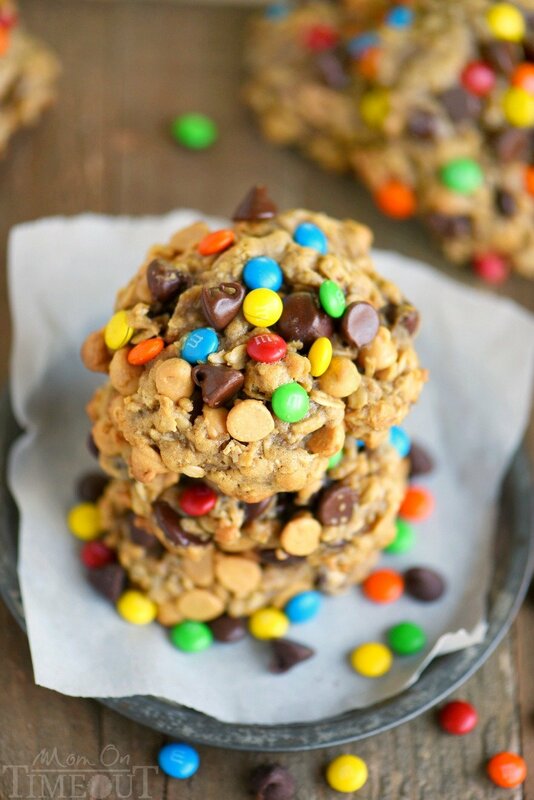 These have it ALL: chocolate chips, oatmeal, peanut butter, peanut butter chips, and, of course, mini M&Ms. Heaven. 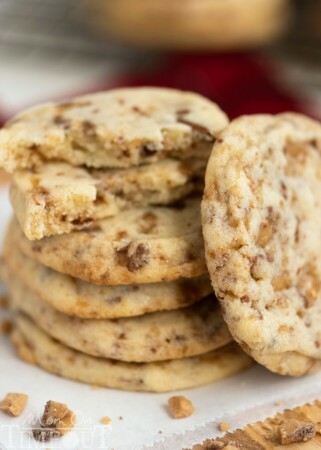 The cookies are so thick and chewy because of all that oatmeal, and they are absolutely impossible to resist. Don’t even try. These cookies are BIG. That’s how I like my cookies. You’ll only need one of these to satisfy that sweet tooth, trust me. I love that this cookie dough doesn’t even need to be refrigerated. The cookies don’t spread much, not much butter and all those oats, so make them the size you want them to be. I used an ice cream scoop and scooped out about 1/4 cup of dough. Perfection. I hope you give these Monster Peanut Butter Oatmeal cookies a try soon! These Monster Peanut Butter Oatmeal Cookies have it ALL! 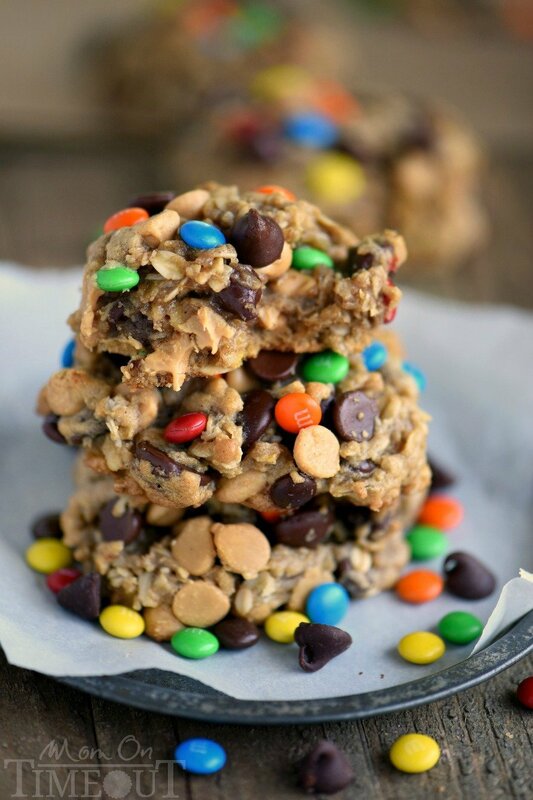 Each bite is filled with chewy oats, peanut butter, chocolate chips and M&M's! Truly the perfect cookie! Line baking sheet with parchment paper or silicone baking mat and set aside. Beat peanut butter and butter together in a large mixing bowl until thoroughly combined. Cream in brown sugar and granulated sugar. Beat in baking soda, salt, and cinnamon. Stir in flour and oats until combined. 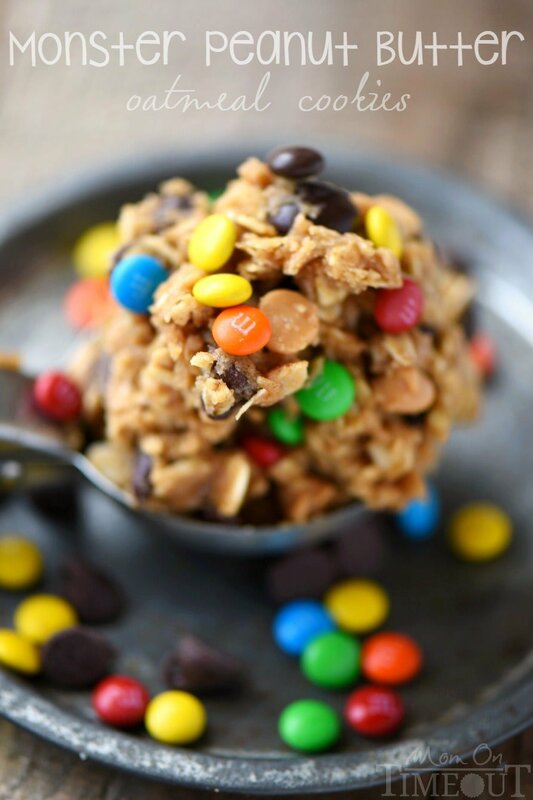 Stir in chocolate chips, peanut butter chips, and M&M's. Scoop out using an ice cream scoop or large cookie dough scoop. 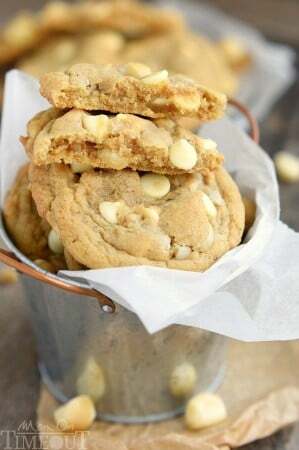 You want about ¼ cup of dough per cookie. Bake for 9-11 mins or until lightly golden brown on top. Let cookies rest for 10 minutes on baking sheet before removing to a wire rack to cool. 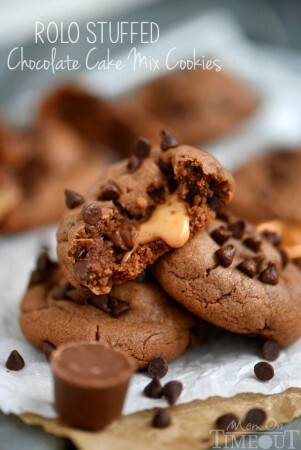 For all Reese’s recipes, go HERE. Wait, these are amazing. 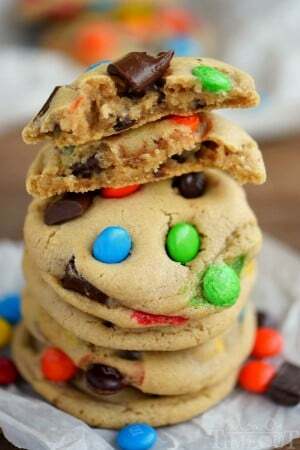 Can we make #MonsterCookieMonday an official thing, but cause I need a dozen (or two) of these in my life ASAP! Ummm, YES. I’m down with #MonsterCookieMonday! Well Linda, that would be 2 cups of flour, right? LOL! My mistake of course 🙂 It’s 1 1/2 cups. Corrected and thank you! Monster cookies are my favorite! I wish I had a couple in front of me right now! Wow. If your grapes keep growing, you can make your own wine! Mom on Timeout label wine! These cookies are IT. I want them all, no matter how big they are!